Air conditioning technology has incorporated heat pump technology for over 30 years now after Sanyo air conditioning produced the first heat pump in the late 70's. Air to water heat pumps are a descendant of this technology but instead of air to air transfer heat is transferred into the water. Air to water units are now starting to become a viable option for home and commercial heating and domestic hot water and all the main manufacturers such as LG, Daikin, Fujitsu and Mitsubishi have brought systems to the market. Many renewable shows such as the EcoBuild are full of manufacturers showing their latest air to water heat pumps. After being installed in homes, swimming pools and commercial buildings for over 10 years now, air to water heat pumps are becoming a tried and tested technology. Air source heat pumps are easy to install and require minimal maintenance once installed. A box style outdoor unit is mounted on the outside of the building and collects the heat from the outside ambient air in to a heat exchanger coil at the rear of the outside unit where air is passed over by a fan to transfer heat in to the system. The air heat pump will use a refrigerant gas such as R407C, R32, R410a and R417a for the heat transfer medium which has a very low boiling point (-48.5DegC R410a) and is compressed into a super heated state by a compressor. Most heat pump compressors are DC inverter driven so are very economical with COP's (coefficient of performance) of around 4 (4 x initial input of power). Therefore an air heat pump with an efficiency of 4 will produce 4000 watts of heat from 1000 watts of electricity input. In comparison to ground source heat pumps air heat pumps are slightly less efficient because ground source heat pumps have a steady heat source from the pipes buried in the ground (usually 10DegC). The good thing about air to water heat pumps when compared to ground source is the installation, the cost and installation implications of ground source makes it the reserve of those with land to spare. 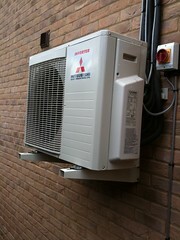 Air to water heat pumps are much easier to install and the only outside space required is the space for the condensing unit which can be mounted on a wall or ground based, This makes air source a more practical and realistic heating system option for all types of applications where ground source under ground piping is not viable. The main use of air source is home heating and swimming pool heating, air to water heat pumps are also a good option if you have no mains gas supply. The air to water heat pump units will operate on minimum power consumption so don't require a large power source and will not use your entire electrical supply up. If there is no option for ground source heat pump's then air source can work out very well. Because there is not a need to dig huge trenches for ground source piping it is also a compact and cost effective installation process with only the need for a plumber and a refrigeration engineer to complete. As long as there is an electrical supply air to water heat pumps are a simple, compact and efficient way of heating an entire home even when temperatures go below -20DegC. Air to water heat pumps have a few limitations. Because the ambient air temperature is variable most air to water heat pumps offer a rating of -15DegC to -20DegC which is a basic figure for the limitations of the refrigerant used either which is usually R410a, R407c or R417a. The COP (coefficient of performance) will drop the colder the outside ambient temperature is but manufacturers don't usually show data on this. The outdoor unit will require mounting on a wall or 100mm from the floor to avoid ice up and must have 200mm breathing space around it. Periodically the outdoor unit will go on a defrost which de-ices the coil which in turn drips water. This will require a drain point to safely drain the water so there are no icy pathways in the winter months. ■ Optimal annual heating factor thanks to the inverter controlled compressor. ■ Speed controlled system pump that supplies the heat pump with suitable system flow. ■ Optimized operating costs. The speed of the compressor is adjusted according to the demand. ■ Prepared for controlling of two heating systems. ■ Integrated active cooling function. The main manufactures have jostled for a share of the growing air to water heat pump market and have over the last few years brought more efficient and quiet units to the market. The main player in the EU market is the Japanese manufacture Daikin air conditioning with their legendary Altherma air heat pump unit. The Altherma is a well thought out state of the art air to water heat pump system designed to offer exceptional worry free service for the duration of its lifetime. Daikin is considered the worlds best environmental treatments company with over 35 years of manufacturing at its European manufacturing plant in Belgium alone. The Altherma units offer a wide range of power outputs and as the units are manufactured in Europe they are usually in stock with a short lead time. Daikin have now brought out the latest in hybrid boiler units with a combined gas boiler and heat pump system which is designed to use the heat pump at its optimum time and save up to 30% over the year on energy usage.